Hi everyone, It's a new challenge at Cornish Heritage Farms, and we love to see anniversary cards. I've used Bird Mail digital stamp from CHF. This is such a fun image with lots of possibilities and since he can't be home for their anniversary, he sent her bird mail. I colored the image with Copic Markers. Because I wanted to die cut it into an oval shape, I carefully cut around the leaves before die cutting so they'd stand out. 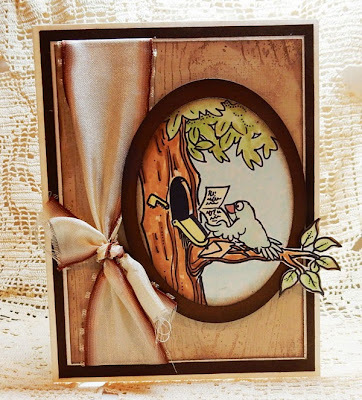 The background was created with the Wood Grain Backgrounder stamp which was inked with brown ink and then stamped onto a lighter brown cardstock. Love how realistic my background looks. Before assembling the card, I tied some coordinating ribbon on the left side, then popped the image on top with foam adhesives.